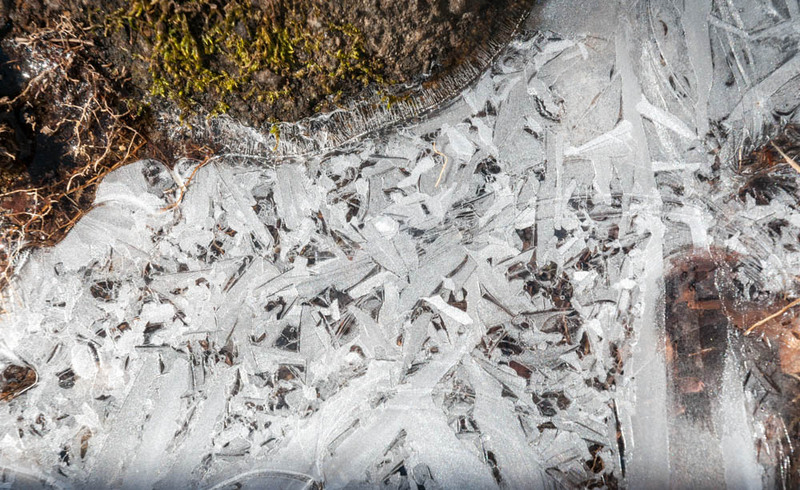 Ice skims the surface of trailside puddles after a cold March night. A lovely day for a hike up Mount Carr, an unassuming 3,400′ bump to the southeast of Mount Moosilauke. I had never visited this peak, so when a friend suggested we try it out I was ready to hit the trail. The lower slopes were bare of snow but it is, after all, still “winter” so none of the trees or undergrowth have started to leaf out. The overnight cold formed a skim of ice across all the puddles and many of the smaller streams, their fascinating patterns glinting in today’s bright sunshine. (See photos!) The upper slopes held a crusty but shallow snowpack, and rippled ice floes. The Presidentials, with a fresh coat of white snow, dominate the view from Mount Carr. 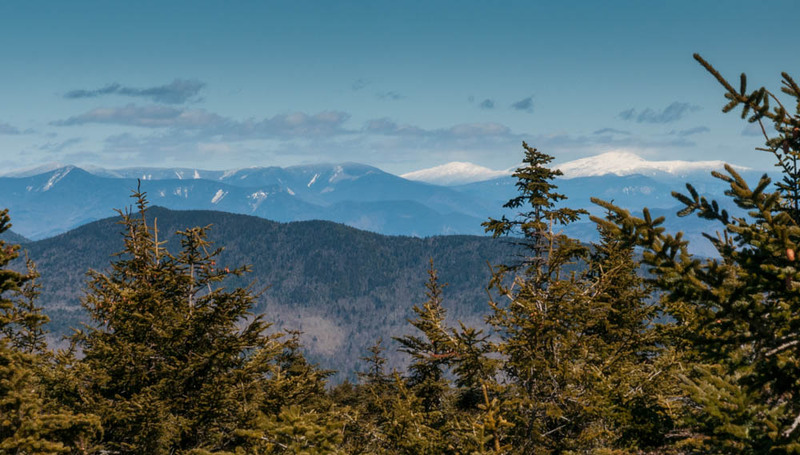 At the rocky summit we could climb on the footings of the long-since-removed fire tower and see the white-capped Mount Moosilauke, Franconia Range, and Presidential Range. I hope to return to the neighborhood and explore the other peaks in the Wentworth-Rumney area! 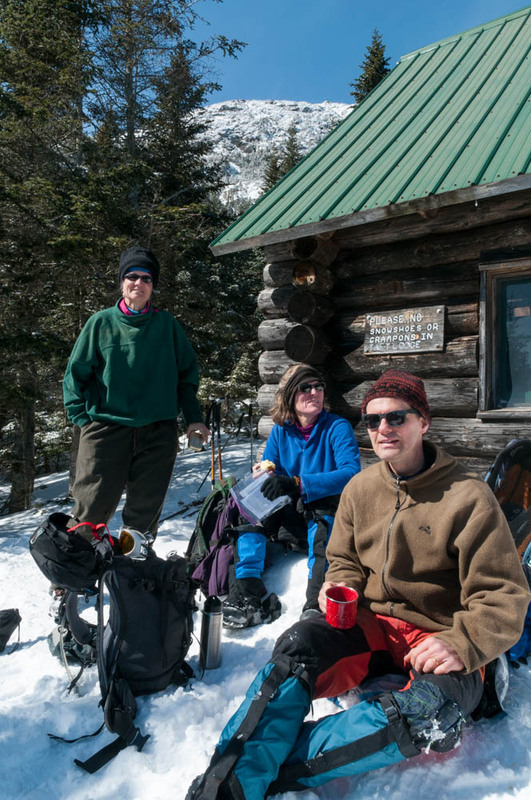 Jen, Lelia, and Lars at a Lunch stop at Taft Lodge on Mount Mansfield. Over the past week I was beginning to think that winter was a bust – with just a handful of great winter outings to show for it. Today proved me wrong. With Mount Mansfield as our goal, Lelia and I set out for Stowe, Vermont and soon met up with Jen and Lars. The parking lot was nearly full of hikers, backcountry skiers, ice climbers, and others eyeing the pure-blue sky and crisp views of the snowy peaks. Heading south on the Long Trail, we climbed steeply up a well-packed treadway smoothed by several groups of skiers skinning their way up ahead of us, and criss-crossed by the carved turns of skiers and snowboarders who left the groomed trails of Stowe for the hardwood glades of the Long Trail. The snow was fairly fresh, with perhaps six inches of powder on top of a firm but not icy base. We reached Taft Lodge for lunch, basking in the startlingly warm March sunshine with a group of three younger skiers, another group of four older Quebecois, all sharing the happiness that comes from bright sunshine, blue skies, soft powder, and fresh air. More below the break.